As a blogger, you may have hundreds of posts on the dashboard as published, pending, scheduled, draft and privately published. WordPress automatically arranges those posts under different heads on the top side. The top menu lets you know how many posts published so far, how many posts remaining as pending, scheduled, privately published and trashed. Now we are going to share another method to quickly locate a post based on its status. Highlight. Give different background colors to your posts in the dashboard. So you can easily know the nature of a post – whether it is published, drafted or something else. 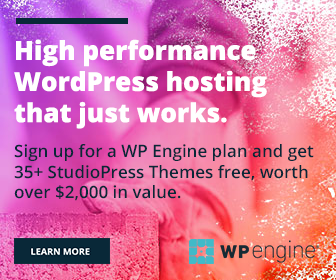 Install and activate WP Edit plugin from the WordPress library first. It is a powerful plugin to enhance your page editor by adding additional functionality to it. 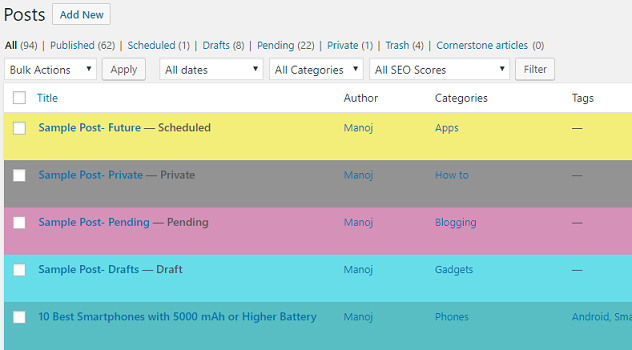 WP Edit brings advanced tools to manage your single posts and pages. It lets you add font family, font size, colour, formats, media and various other buttons in the WordPress page editor. After activation, the plugin will create a new top-level menu in the left pane- WP Edit. Open it to view and customize various parts of WordPress backend. It shows options across different categories like buttons, global, general, posts/pages, editor, extras, and user specific. Choose User Specific tab to highlight your dashboard posts. 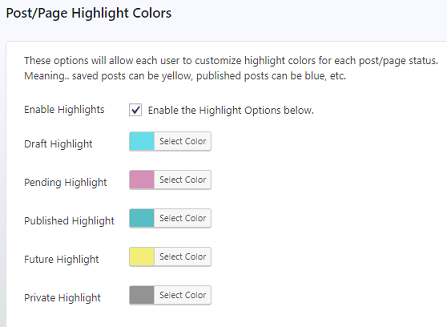 Enable highlights and select colors for each post/page type. Save options to update your posts. Visit Posts > All Posts screen to see the changes. The posts appear in colorful backgrounds according to their status. Scheduled posts are in yellow, published posts are in medium turquoise, private posts are in grey etc.